Collapsible Water Bottle – Anything to save that valuable space in your suitcase. This water bottle is collapsible for much easier transport than the traditional water bottle. Korres Radiance Set – Mini skincare sets like this are the perfect solution for travelers who prioritize their skin and skincare routines. Because of their size, they are easy to travel with and can easily be put in a small makeup case for quick application throughout the day of travel. I’m always looking for hydration sets and this one comes with a moisturizer, facial oil and a sleep facial. The perfect combo. Samsonite backpack – I have this exact backpack and I love it. I carry it everywhere and not just when I travel. The backpack is durable and stylish and fits a camera, lens, a light jacket, a laptop and a small makeup bag when the zippers unzipped! Travel T-shirt – Can you say hello in over 10 languages? I’m sure your travel-loving friend does or at least wants to learn! Delsey Carryon – One of the most sleek and beautiful carryons you can gift someone (or yourself!). 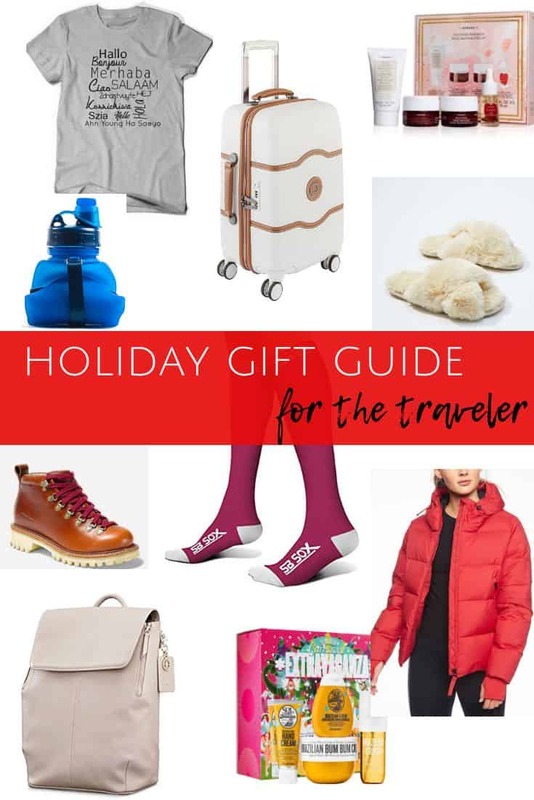 Delsey is a great option when it comes to luggage gifting. Compression Socks – If you’re looking for practical gifts, then these are it. Compression socks are vital for the traveler and these come in a variety of colors. Bum Bum Cream – This stuff smells heavenly (coconut hints) and is a great set to grab for a friend. The mist and hand cream will come in handy for someone who constantly flies. Fur Slippers – If you’re anything like me, you kind of hate being barefoot in a hotel or Airbnb (unless it’s super clean). These comfy fur slippers are convenient and easy to travel with. Slip them on mid-flight for even more comfort! Hiking Boot – Many travelers are also avid hikers and these boots are a classic. They come in both mens and women sizing. Athleta Snow Down Jacket – This coat will come in handy during winter and for any travels you or your loved one may have coming up. On top of it being super warm, it comes in the prettiest pop of red. I love those wooden Swell bottles. They fell like you’re out in nature! Great guide Grace! After my trip to Puerto Rico I’ve realized how much those facial sprays are needed!! And that tshirt is perfect for me!! haha!! Great list, Grace!! I think I have those Raybans 🙂 and I loveeeeee Mario Badescu! Love the luggage tag and passport holder, I haven’t seen those before.